Having lived in Tokyo for over four years, London-born photographer Chris Lloyd, better known by his online handle Ghost Dances, has a perspective on the city that lies somewhere in between a tourist and a local. As a result, his work stands out from the stereotypical images of shrines, cherry blossoms and neon lights often associated with Tokyo. Chris has a keen eye for capturing the emotion in everyday moments, from celebration to solitude and everything in between. I caught up with Chris to talk about his work and the challenges and motivation behind it. What motivated you to start doing street photography? A few years ago I rediscovered the work of Bruce Gilden, a really famous street photographer from New York who’s known for his candid close-ups. Being in Tokyo, I was in a new environment and it’s fun to explore so I thought why not give it a try. A lot of portrayals of Japan in photography are really stereotypical, how do you break away from that? I don’t really go out into the street and see ‘Japan’. I’ve been here for four years now and when I started street photography I’d already lived here a year so everything still felt quite normal. 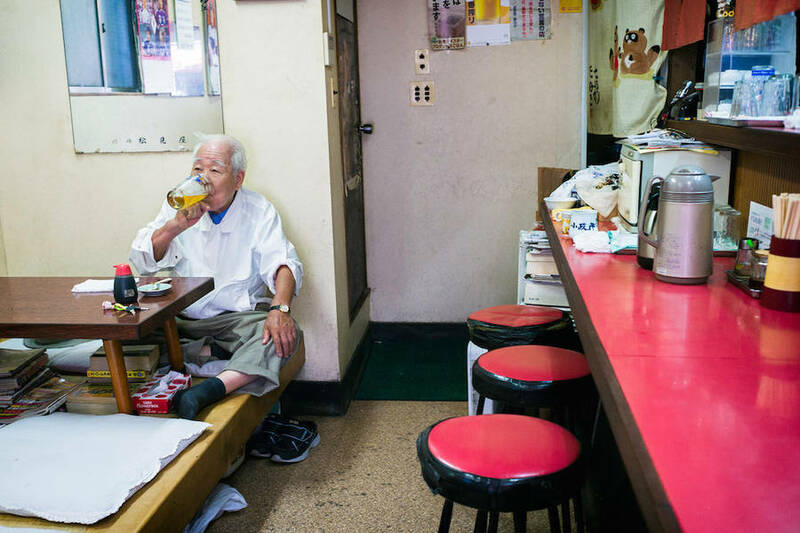 I’ve seen and done the tourist side of photography in Tokyo – It’s out there and it exists in abundance and I can’t do a better job of that or do anything different with that. My street photography has never been specifically about Japan- it’s been about my environment and I just happen to be in Tokyo. I started this primarily because I love it and I was in a new place and I wanted to share that with other people. Not necessarily that ‘Japan’ image, but if I walk along the street and see a dead bird, and an old guy poking it—I want to see that and I want to capture that. My work isn’t about taking photos of Japan; it’s more about capturing weird, funny and interesting moments. You can’t predict what’s going to happen on the street and you can’t change anything about the situation. There’s a lot of trial and error involved, especially in getting photos that are good quality as well as interesting. Sometimes I’ve gone out and taken a thousand photos in a day and they’ve all been crap—overexposed or blurry or just not right. Other times I’ve gone out and the images are all lovely and sharp but they’re boring, and the whole thing about street photography is that if it’s boring there’s no point even putting it out there. You could have the best lighting and colours and composition, but if it’s boring nobody cares- nobody’s going to look at it. You’ve done editorial and commercial work as well, how does it compare to street photography? Editorials pay! Which is the nice thing. My enjoyment from doing commissioned or corporate work is that I get to work with great people, and I get to control things creatively. I can use weird lighting or we can go to strange places and I have a lot of choice- it’s controlled and that gives me a sense of satisfaction. Street photography is a completely different beast. It’s random and chaotic. I’m just out there observing and if I see something interesting I shoot it, and then it’s gone and I forget about it. There’s a different kind of satisfaction, which is more like an adrenaline rush and almost perverse but in a non-sexual way. Like that voyeuristic I’m looking at you but you don’t know I’m looking. I guess it’s kind of creepy but lovely at the same time. Have you ever been apprehended by anyone in your photos? No, never. I try not to be noticed and not to be in people’s faces. If people do notice me taking their photo, most of them have a positive reaction. Once a guy sort of apprehended me but I wasn’t actually even trying to take his photo, he just walked into the frame. I haven’t been punched in the face or anything yet, which is good.